Just sorting a few things out in my office. Well, my dining room that’s a mess. 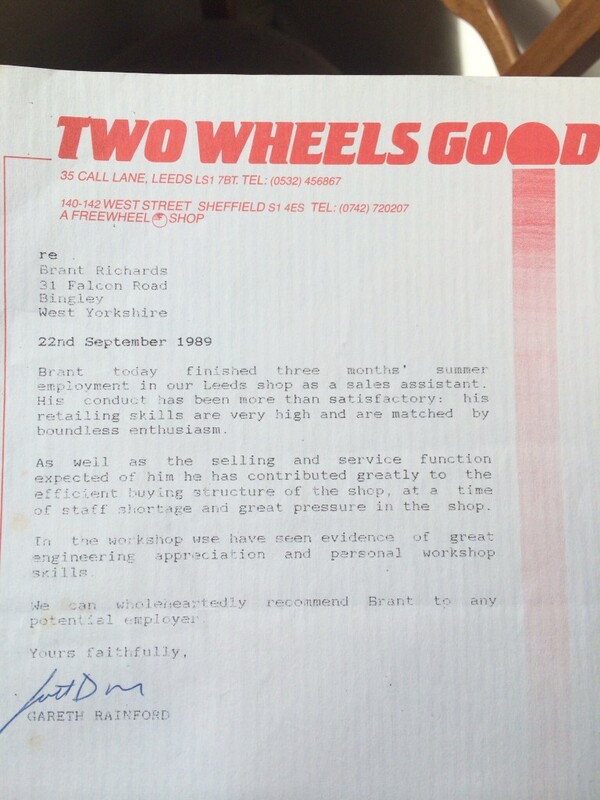 Tripped over my reference from my first “industry” job at Two Wheels Good in Leeds, which I ended up with after my mum rang up John Stevenson to see if there were any Saturday jobs going. There were, he rang me back, and I didn’t find anything out about their conspiracy until last year. Two Wheels Good was a great environment. A CoOperative, with a frame building workshop on the top floor of the building in Call Lane, Leeds. Andy Morris, one of the partners, patiently assisted my teenage enthusiasm for lathes and brazing, and let me loose on making stems and even frames. Malcolm assisted in teaching me about geometry. And Stevenson was Stevenson. It was a great bike shop. I bought one of the first Kona Cinder Cones in the country from there. Did they become ‘Freewheel’ or was that different. Either way it was sad to see it go. Bike co-ops are a great thing. I think I met you around the same time. There was a trials event somewhere where you turned up (with your dad I think) with funky bars with integrated bar-ends and brake levers under them. Ace – was a great event! Full of very average mountain bikers dicking about in the woods. Can you remember where it was?